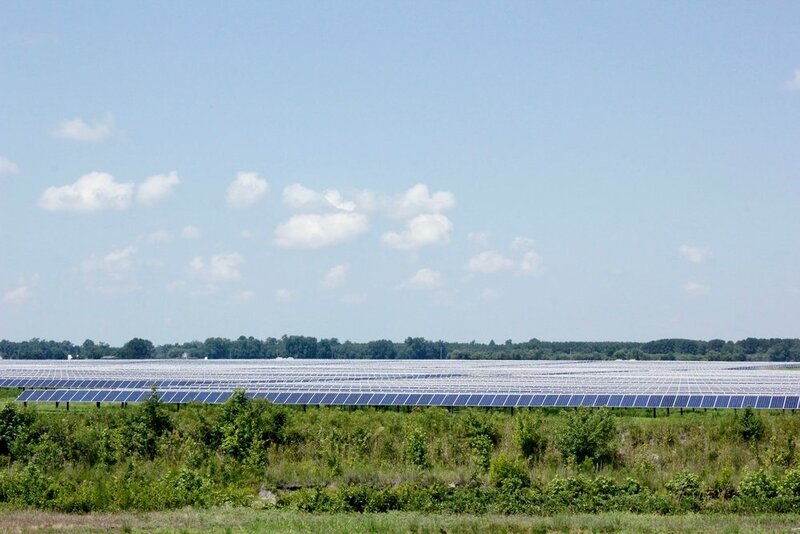 I walked on the site of Duke Energy Renewables’ largest solar farm, capable of powering about 17,000 U.S. homes in rural Conetoe, North Carolina. It was tucked behind a small plot of RV homes, and was surrounded by agricultural land. The solar field was in an area of small towns and large farm plots. We got out of the Ford truck close to 11 am, and it was stifling. The area was bug ridden, and the humidity and sheer heat made it almost unbearable to be in the field. The George Washington University (GW) is powered by 50% solar, and as a GW alumni and Fellow with the university, Duke Energy Renewables agreed to show me where their energy comes from, along with a couple other farms in the area. This one I visited was an 80 MW site with over 400,000 solar panels covering 800 acres. From every viewpoint, I saw solar. I climbed a hill, looking down try to maneuver through the ant mounds. I looked up and was overwhelmed with solar. I saw nothing but panels and there was no end in sight. The farm was developed through what's called a power purchase agreement (PPA), where energy consumers (companies, utilities etc.) buy a certain amount of power at a set price for a long period of time, usually 15-25 years. The companies Corning and Lockheed Martin created the PPA to serve their North Carolina and Maryland operations, respectively. 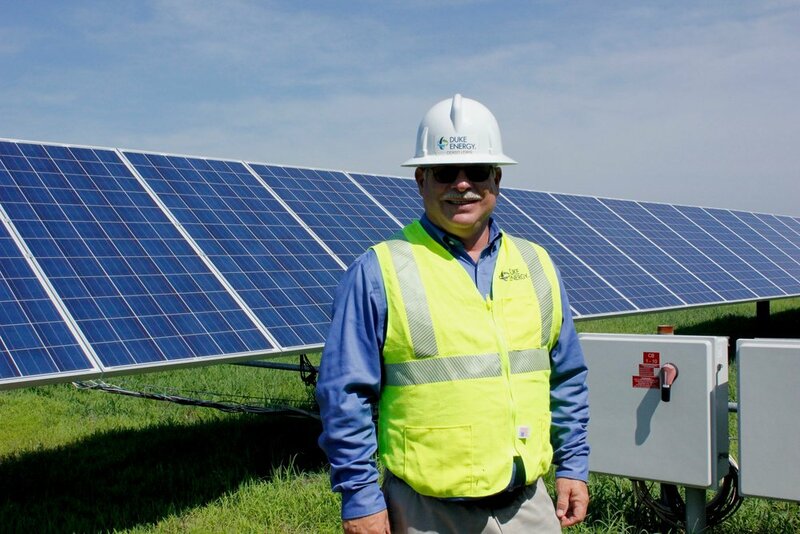 I was standing on the largest solar farm in Duke Energy Renewables’ portfolio. It consisted of rows and rows of large solar panels. It also had an enclosed, air conditioned monitoring room where the solar radiance and number of MW produced were displayed on screens. And as with any power plant, there was also a transmission station on the site. 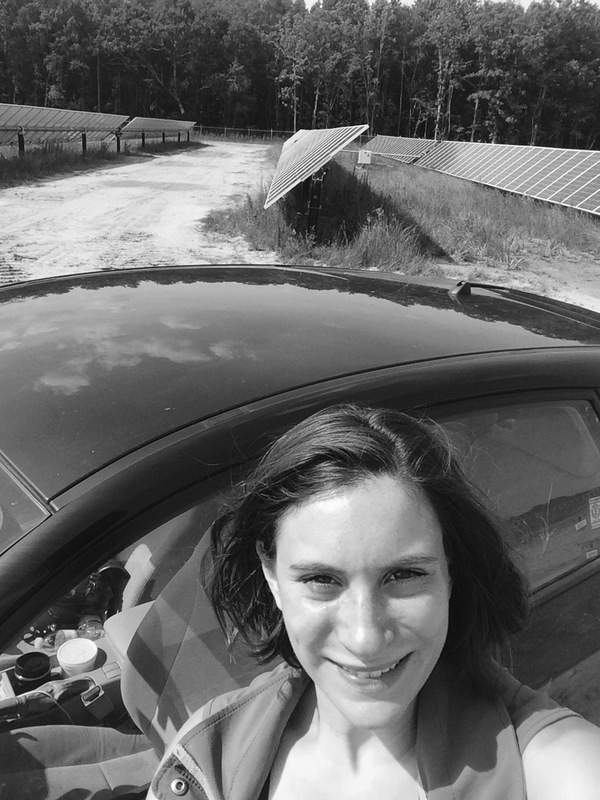 Later in the afternoon I traveled about 30 minutes up the road to a smaller farm, one of three solar farms that GW, GW Hospital and American University developed in North Carolina to serve their energy needs. Together it’s called The Capital Solar Partnership. The three institutions decided that they wanted to be powered by clean energy, and found a power provider to build solar farms within their energy market, PJM Interconnection, and to sell them the power. Each institution established a PPA with Duke Energy Renewables. In the long run, the institutions save on their energy costs, as the market price per kwh of electricity rises. It’s a way of securing clean power now and energy security in the long term. This is an especially popular model for institutions and big companies with high energy costs, long term need, and some capital to spend. The developer, for example, Duke Energy Renewables, just needs someone to say, “yes, we will pay for power from this solar farm for the next X years,” and then can securely invest in building the new infrastructure. As I hopped around from site to site backed by private institutions and companies, something became so clear to me: it’s all about demand. The solar farms would not have been built if these institutions and companies did not have the interest in it, for whatever reason. Maybe it is part of the sustainability goals of the organizations, or a priority of the shareholders, but for one reason or another, they wanted to invest in clean energy to power their organizations. I thought back to other scenarios when demand made all the difference. In 2016, I toured Sims Recycling Facility in Brooklyn, NY that processes New York City’s recyclables. The manager explained to me that right now they have one Chinese buyer that agreed to purchase dirty plastic bags, used by consumers to carry take-out and hair products from CVS and then thrown away. The moment that the one Chinese buyer decides that it is cheaper or preferable to buy clean plastic bags, or manufacture elsewhere, and no longer needs those dirty plastic bags they are no longer recyclable in the city. They have nowhere else to go. No one wants them. And therefore they go to the landfill. Recycling is not enabled by the technology at the facility, the collection process or consumer behavior, so much as the demand for the material to be used again. We cannot count on a couple big companies to do the right thing. Or one Chinese buyer to take all of our garbage. We need to be demanding good processes- clean energy, goods that are common enough or malleable enough to have second uses. We are the demand. When we as individuals band together to each demand something good (a better box, less plastic, fewer receipts, cleaner power), we all win. I wish I could tell you how happy I am to be in West Virginia. It is definitely in part because I was going stir crazy in the house, but it is also because I am so happy to be interacting with locals, learning, and absorbing the scenery and culture of the state. My experience, my two days here, have been overall very hospitable and enjoyable. My first stop in West Virginia dispelled the rumors. I stopped in the eastern most part of the state in Shepherdstown to meet the good people at Solar Holler, the company that essentially started the solar industry in the state. Shepherdstown happens to be WV’s oldest town, founded in 1762. Solar Holler is located on the main strip of the town’s center on German Street. According to a local, nearly all of the houses and shops on the strip were former medical centers during the Civil War. There were some southern attributes to the buildings, but If I could have isolated the town, and placed it somewhere that I knew, it easily could have been a quaint quirky town in Vermont or upstate New York. It is a historic town, a tourist town with Harpers Ferry nearby, and a college town, home to Shepherd University. I ate at a cool restaurant called “Domestic,” that serves vegetarian friendly meals (as well as non-veggie). There are farms and breweries listed on the menu to indicate the local origins. it was next to some other cool spots- an antiques shop, coffeeshop, a vintage dress shop, and a couple photography studios. Sidewalk signs offered live music and open mics, and there were anti-pipeline signs in nearly every store window. It was fit for a getaway from the city, whatever city. It’s a small, historic, hip town. It was not the West Virginia I was expecting. In route to Shepherdstown, I saw condos and homes comparable to those in suburban New Jersey (of course with much more land in between). I passed a couple Mercedes in the town. Parked on the street across from the restaurant was a car with a bumper sticker that said “My Boss is a Jewish Carpenter.” At least the one car, a Prius with a WV license plate, communicated an openness and tolerance toward religion, one I generally don't encounter and certainly didn't expect to find in the state. When I told people I was traveling to the state by myself (as an journalist/researcher/environmentalist to see power plants), there was concern for me. Even one West Virginian who I knew from my days in DC said to be careful about how I speak to people- it’s coal country. And I knew that going in. The concern was not out of the ordinary, or uncalled for. I am clearly a Yankee. I am from the northeast. I have a bit of a New York accent. I carry way too much stuff with me, so I am automatically deemed a tourist or a traveler. And I am very trusting of people. Sometimes my lack of common sense, and willingness to see the good in people results in what my parents would refer to as silly decisions. But West Virginia has been good to me. Granted, I haven’t gotten into the thick of it. I haven’t toured mines or spoken with miners. I haven’t sat in people’s living rooms and asked them about their jobs. But I have chatted with locals, and stopped at the side of the road to take pictures of a coal mine and plant. I have traveled with a camera. There was room for antagonistic sentiment. The lack of antagonism could be partially because of my approach- my pitch is educational. I am writing about energy, not making a political statement. But it’s also thanks to the local atmosphere and the people here. We spoke of the pride of working in the mines- the unique glory that comes with the danger of the work. It is sort of akin to the glory of firefighters or police officers, yet different because the people work in another world below the earth, fighting for energy- there is a subculture of working underground. She told me about a friend’s son around my age who passed up working for his dad’s Subaru autoshop to work in the mines, beaming that’d he’d be mining coal for $36/hour. She recalled how he stopped in for lunch one day with a face entirely black. There was no mask because she would have seen a white outline. She hoped he and others would take up training at a nearby wind technician training program. She had only recently heard about the ponds of water that were used to absorb pollutants for the coal, and stored out in the open with no cover. She was beginning to understand what it “dirty energy” meant, and how the water and pollutants can leach into ground water. She knew they were lined with clay but that these ponds shouldn’t be a permanent solution. 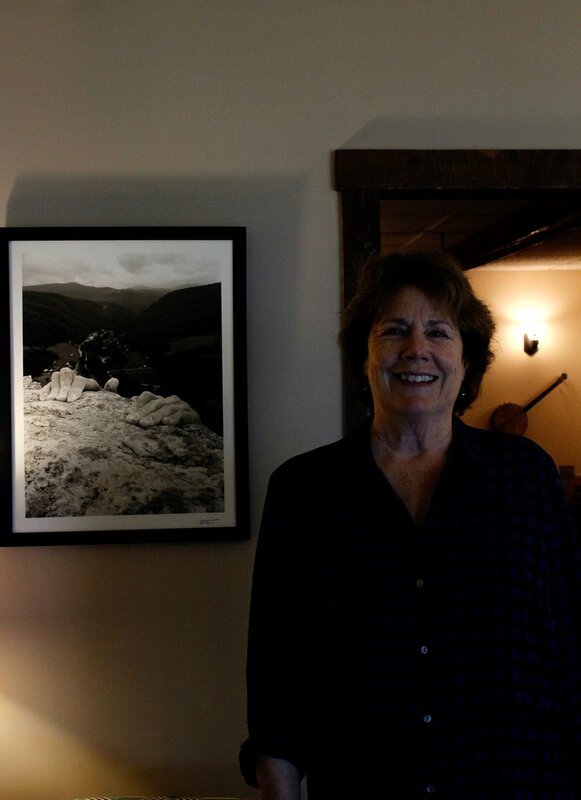 Susan called the area in nearby Thomas the "perfect energy or coal corridor," with a coal processing facility, as well as coal deposit sites, and the Mt. Storm plant down the road. There were also wind turbines in the backdrop of the coal power plant. Susan described to me the rock and piles of earth that remained from the mining process and had been layered like a wedding cake with grass growing a top. Once I knew what i was looking at it all made sense. We also spoke about the black lung epidemic and the fund to pay for affected workers Her call for economic diversity echoed what I had heard from Solar Holler’s founder, Dan Conant. She was extremely kind, and willing to connect me to her daughter who runs in social justice circles in Charleston. For breakfast the Inn chef made me both a dish of delicious beans, eggs (I believe it was called “hot mess”), and indulged my desire for sweets with a wonderful chocolate chip pancake. It was clear that I could really spend 5 days in the state, not 2. Especially because I spent most of both days driving- today heading west through the George Washington National Forest down winding roads. Susan told me to call for anything at all. So when my car sounded funny, and I couldn’t decide if it was from the beating rain or something under my car, I called. She sent me to a local autoshop, “Falcos” where they hoisted it up, investigated, and test drove it at no charge. They found nothing wrong, which gave me comfort as I was going into a a four hour drive to Huntington in intermittent torrential rain and fog. It was the same friendliness that my DC West Virginian friend displayed. He and I laughed at how unfriendly people were at our DC apartment building’s rooftop pool. “It’s like the Hard Rock” I remember him saying, and I couldn’t agree more. I was always the friendly one, but rarely was it reciprocated. It’s not a surprise that he’s from West Virginia. Tomorrow I’ll connect with Coalfield Development Corporation, an organization that is incubating social enterprises for former coal miners and providing jobs in agriculture, electrical sector, construction, and artistry. One of which, Rewire Appalachia, is the partner of Solar Holler- the workforce that installs the solar panels for their projects. I know I am not paying a mortgage here, sending a kid to college, putting food on the table. There are parts that are hurting, and areas with drug epidemics. I am simply passing through a couple parts of the state. There is not a single Whole Foods, Trader Joes, or Costco in the state. But I am pleased to be here, and see continue to meet to people working to diversify and revitalize the West Virginian economy. And I’d come back.